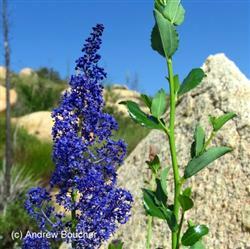 This under utilized lilac is an erect shrub gowing to 12' tall with an open, spreading habit. A stand of this wild lilac in bloom is a real sight to behold. It is covered in gorgeous radiant blue flowers in spring. It is one of the later flowering lilacs. It is fast growing and may need some pruning to keep it in shape. It does great in coastal California landscapes but needs good drainage and very little water.